The DSP Specialist (DSP-III) Certification represents the highest level of certification for DSPs offered by the National Alliance for Direct Support Professionals (NADSP). It is designed to recognize DSPs who have obtained specialized training and have demonstrated competence in providing specialized support to people with disabilities in community-based human services. This certification recognizes those who have already achieved DSP-R, DSP-I and DSP-II status and want to also achieve recognition for their specialized knowledge and skill in five different areas. The five DSP Specialist Credentials are for Inclusion, Health Support, Employment Supports, Positive Behavioral Support, and Aging Supports. DSPs must apply for each specialist credential separately. The focus of the guidebook is on the DSP-III, or DSP Specialist Certification. The guidebook lays out the various eligibility requirements, application components, certification expectations, and more. It also explains what DSPs already certified at the DSP-II level need to do to obtain the DSP-III specialist certification, and provide information and strategies that DSPs and employers can use to help DSPs to achieve the DSP Specialist (DSP-III) Certification. Your DSP-Specialist application packet will be reviewed by NADSP within 90 days of receipt. If your application meets the criteria for advanced credentialing you will receive your DSP-Specialist recognition package. The package includes an embossed certificate that personally identifies you as a DSP-Specialist in your particular specialty area, a lapel pin that reinforces the achievement of the DSP-Specialist credential, and a personal letter from NADSP congratulating you on your achievement. The DSP-Specialist in Inclusion credential (DSP-S-I) recognizes competence in supporting the inclusion of people receiving support services in the communities in which they live and work. These specialists understand why inclusion is important and have demonstrated the skills to enhance inclusion of people receiving support services including: understanding their role in community inclusion, matching community resources with individual interests, building bridges within communities and utilizing natural supports. Personalized letter from NADSP congratulating them on their achievement. The DSP-Specialist in Health Support credential (DSP-S-HS) recognizes competence in supporting people utilizing community human services to make good choices related to their health.These healthy choices may include things such as eating healthy, visiting the doctor regularly, and getting the right amount of exercise. These specialists understand health-related issues across the life span for people with disabilities and can support individuals working with health care providers. Letter from employer in support of competence and professional integrity in the area of health support. The DSP-Specialist in Employment Support credential (DSP-S-ES) recognizes competence in knowing and understanding the value of work to all people and their role in the facilitation of positive work opportunities for those they support. Employment Support specialists help create these opportunities by using a personalized combination of job development, job coaching, and interpersonal skills to make employment a reality. Letter from the employer that verifies the applicant has one year of continuously providing employment support opportunities for people who use community human services, and supports the applicant’s competence and professional integrity in the area of employment support. The DSP-Specialist in Positive Behavior Support credential (DSP-S-PBS) recognizes competence in ways to support people who have challenging behaviors.These specialists are skillful in strategies that are safe, fair, compassionate, person-centered and effective in preventing and reducing problem behaviors. Letter from employer in support of competence and professional integrity in the area of positive behavior support. 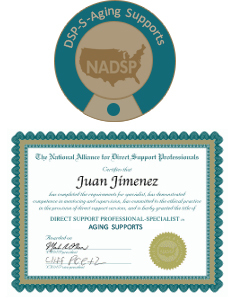 The DSP-Specialist in Aging Support credential (DSP-S-AS) recognizes competence in ways to support people who are aging. The competent DSP Specialist in Aging Support will understand how aging affects a person’s physical and mental health and will be aware of, and document, such changes in the person receiving supports. The competent DSP will support a person to ‘age in place’ for as long as desired/possible. Letter from employer in support of competence and professional integrity in the area of aging support.